Donna Kukama is an interdisciplinary artist whose work is informed by a performance-based research processes. Her work resists established ways of doing, often presenting institutions, book chapters, monuments, or historical archives that are as real as they are fictitious. Through performance, video, sound, texts, and non-monuments, her work questions the way in which histories are narrated, as well as how value systems are constructed, often resisting established ‘ways of doing’. Kukama has presented performances at the South African National Gallery in Cape Town; the Museum of Modern Art in Antwerp; the New Museum in New York; and participated in the 12th Lyon Biennale, France; the 6th Moscow Biennale of Contemporary Art; the 32nd Bienal de São Paulo. 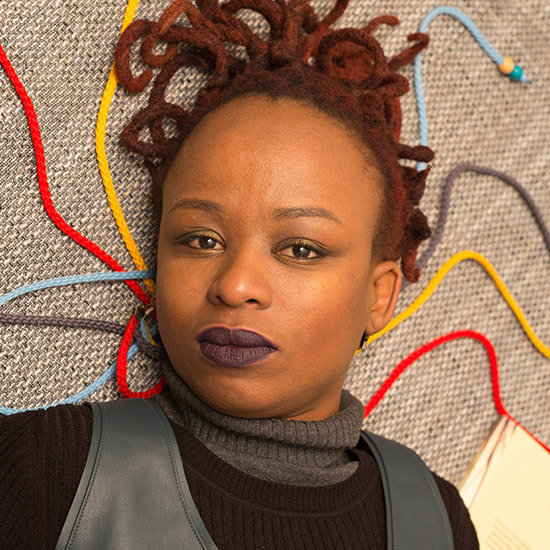 She was recently one of the small group of artists invited to launch the 10th Berlin Biennale‘s public program, and was also a part of the South African Pavilion at the 55th Venice Biennale. Kukama is also a member of the Center for Historical Reenactments (CHR – founded 2010. died 2012. haunted 2013. exorcised 2014. Musemified 2017).